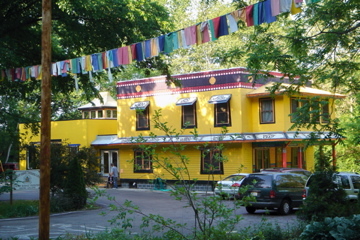 Dagom Gaden Tensung Ling Buddhist Monastery (DGTL) in Bloomington, Indiana, USA was founded in 1996 by the renowned Tibetan Buddhist teachers Ven. Kyabje Dagom Rinpoche and Ven. Gonsar Rinpoche. Their deepest wish in establishing the monastery was to preserve for the benefit of all sentient beings the Buddha’s teachings as transmitted by the Gelugpa lineage of Tibetan Buddhism. Though DGTL functions as a traditional monastery for monks of this lineage, it also welcomes lay people of all nationalities and backgrounds to participate in its many religious, cultural and educational programs. These include sacred teachings by visiting and resident monks, the construction of precious sand mandalas, daily prayer services, guest lectures to schools and community groups, and the annual Taste of Tibet in which the monks cook Tibetan delicacies for the communities of Bloomington and Cincinnati. DGTL is nestled at one end of Bloomington, Indiana’s Lower Cascades Park, a natural setting with cliffs, a creek, and a waterfall. The quiet monastery grounds and the building are decorated by hand with traditional Tibetan colors and designs. Preservation of all the authentic oral transmission lineages of the Gelug Tradition founded by the great master Je Tsong Khapa, and transmitted through an unbroken line of masters of our time, such as the great Pabongka, His Holiness Trijang Dorje Chang and Kyabje Zong Rinpoche. Foreseeing the great danger of dilution and degeneration of this pure tradition at its source in the Tibetan community, giving it special attention is seen as indispensable for its preservation for the sake of all beings. Following the very intention of the Buddha, as well as the great founding masters of the past, all the activities of this institution will be centered around a monastic community based upon the solid foundation of the Vinaya tradition. All the studies and practices of Buddhism will be conducted on the basis of the most complete and clear teaching of Dharma given by the matchless great teacher Je Tsong Khapa and his lineage-holding great disciples up to the direct masters of the present. It will be open to people from all walks of life, regardless of their race and origin, who are sincerely and seriously interested and eager to learn and to practice such teachings. To provide everyone interested in learning and practicing the various aspects of such an authentic transmission with the possibility of studying and guidance in the practice of meditation through organizing permanent study programs, lectures, weekend seminars and occasional week-long courses. To give support and assistance to all the monastic communities, organizations or individuals adhering to the same authentic tradition, especially at its source in Tibet, India, China and Mongolia. In concordance with the aims and objectives of this organization, Dorje Shugden, the protector deity of this particular lineage of Dharma, will forever be the patron figure of this organization as well as that of all affiliates. This entry was posted on Sunday, September 26th, 2010 at 8:35 am	and is filed under Monasteries. You can follow any responses to this entry through the RSS 2.0 feed. You can leave a response, or trackback from your own site. A beautiful Tibetan Buddhist monastery in the U.S.A. devoted to the spread of the teachings of Lama Tsongkhapa. And a Dorje Shugden monastery! 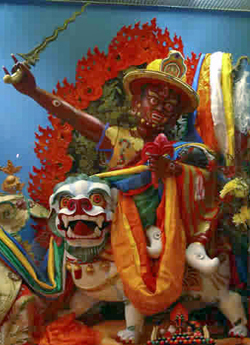 The fifth point in the list of aims and objectives openly states that Dorje Shugden is the “protector deity of this particular lineage of Dharma”. This organisation seems to be doing very well, thanks to the Protector. This monastery (in America) was founded, in 1996, by two great Gelugpa Lamas, Kyabje Dagom Rinpoche and Gonsar Rinpoche, with the expressed wish of preserving “ for the benefit of all sentient beings the Buddha’s teachings as transmitted by the Gelugpa lineage of Tibetan Buddhism”. The founder of the Gelugpa lineage, Je Tsongkhapa, had actually integrated the essence and all the best of the old Kadampa lineage teachings beginning from Lord Atisha, as well as the best of the teachings of the existing lineages at that time – the Nyingma, Kagyu and Sakya lineages. – to form this lineage’s teachings. Je Tsongkhapa’s Lamrim, the Graduated Stages of the Path to Enlightenment( a detailed and structured recreation of Atisha ‘s ‘Lamp of the Path to Enlightenment’ in a manner that would be most efficacious for beings with degenerated minds and mindsets), encompasses all of Lord Buddha’s 84000 teachings designed to address the 84000 afflictions of the mind and the different mindsets. Much later, and closer to our time, Je Pabongka, also painstakingly acquired and realized the important teachings of other lineages, like the Sakya and Nyingma lineages, as well as other venerated sources to add to the existing Gelugpa lineage teachings. He then carefully transmitted this complete set of teachings of both Sutra and Tantra to a single heart disciple, Trijang Rinpoche. Through Trijang Rinpoche – the Tutor and Root Guru of the 14th Dalai Lama and the Lama to many other great Tibetan teachers of the Gelugpa lineage – all the transmissions were carried safely to India and passed to Trijang Rinpoche’s students(the high Lamas of the Gelugpa lineage). This became ‘the living foundation that is the Gelugpa lineage’ today. It is most fitting that this monastery’s Dharmapala is Dorje Shugen, the protector sworn to protect Je Tsongkhapa’s lineage teachings (which are also Lord Buddha’s teachings in their entirety), in particular Je Tsongkhapa’s unexcelled clear teaching on Nargajuna’s Middle View on Emptiness , so very necessary for the liberation of all beings from the root cause of suffering. Dagom Gaden Tensung Ling Buddhist Monastery (DGTL) situated in Indiana and founded by 2 Great Masters Ven. Kyabje Dagom Rinpoche and Ven. Gonsar Rinpoche. Their wish are to preserve the Gelupa Lineage teachings handed down by Lineage founder Je Tsongkapa. This Monastery is built to cater for lay people irregardless of race or backgrounds to participate in all the Holy activities of Tibetan culture and tradition. Dorje Shugden is the main Protector of this special Lineage of Dharma. And he is also the wrathful emanation of Manjushri. This Protector who is also a Buddha will be able protect and benefit sentient beings spiritually and worldly.